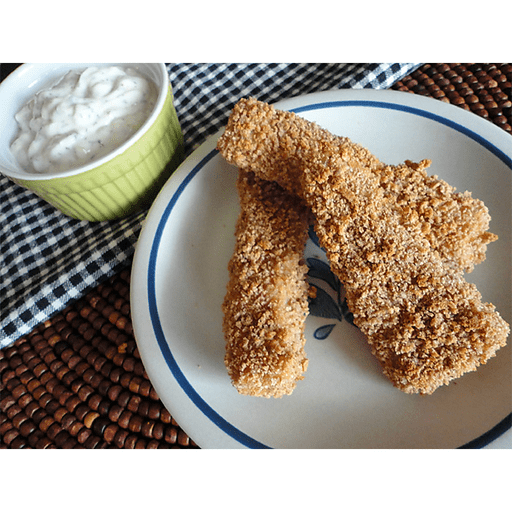 These flavorful Crunchy FIsh Dippers are the perfect weeknight meal. 1. Preheat oven to 425°F. Prepare a baking sheet by lining it with parchment paper. 1. Cut fish into strips about 4-inches long and 1-inch thick. Pat dry with paper towel. 1. Prep breading station in three separate shallow bowls. In the first bowl mix flour with 1 tsp. Old Bay seasoning. In the second bowl, lightly beat eggs. In the third bowl combine panko breadcrumbs with remaining 1 tsp. Old Bay seasoning. 1. Working one piece at a time, dip fish in flour mixture, then egg (allowing excess to drip off), and finally in the panko mixture. Lightly press breadcrumbs onto the fish. 1. Place breaded fish pieces onto the parchment-lined baking sheet and spritz lightly with cooking spray. 1. Bake for 10-12 minutes, turning once during baking, until browned and internal temperature reaches 145°F. 1. For tartar sauce, combine yogurt, mayonnaise, pickle relish, dill weed, and salt and pepper to taste. Serve with the baked fish dippers. Use another fresh white fish fillet in place of cod. Haddock, tilapia and catfish would be good alternatives. Calories 300, Total Fat 9g (Saturated 1g, Trans 0g), Cholesterol 140mg, Sodium 520mg, Total Carbohydrate 27g (Dietary Fiber 4g, Sugars 3g), Protein 28g, Vitamin A 4%, Vitamin C 4%, Calcium 4%, Iron 10% *Nutritional values are an approximation. Actual nutritional values may vary due to preparation techniques, variations related to suppliers, regional and seasonal differences, or rounding.